Your credit score is one of the most important figures associated with your finances. And you have likely heard the television and radio commercials touting that you have three credit scores. However, you actually have more than just three credit scores. There are a many ways to calculate your credit score based on what type of loan or financial product you are seeking to receive. Which credit score is the most important? Which scores should you ignore? And why do you have so many different credit scores? Your FICO score — also know as your Classic or BEACON credit score — is your real credit score. This number is the most important score to focus on as you work to improve your creditworthiness. FICO stands for Fair Isaac Corporation, the company that came up with one of the first credit scoring systems in the 1950s. 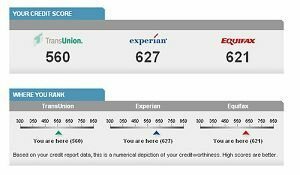 In reality you have three FICO credit scores: one from each of the credit bureaus (TransUnion, Equifax, and Experian). When you hear those commercial jingles on how having one bad score out of your three scores can hurt your creditworthiness, they are speaking to one of the credit bureaus having incorrect information and negatively impacting your score. There is only one way consumers can purchase access to their credit score at any time: at MyFICO.com. Otherwise you may be able to get your FICO score (or some variant of it) when you enrolled in a credit monitoring service, or applying for a lending product. Aside from getting your true FICO score there are a number of firms — including the credit bureaus themselves!– that offer you access to a different score that they calculate. If your real credit score is your FICO score, then these scores are “FAKO” scores. They have different minimum and maximum score numbers, and are not calculated the same way as your FICO score. An example of a FAKO score is TransUnion’s VantageScore. While you only have three FICO scores, there are different products that lenders can purchase to judge your creditworthiness. These are called enhanced credit scores, and what they are enhanced by is determined by the loan you are seeking. If you are applying for a new credit card, the credit card company can request a Credit Card Enhanced credit score. This score places more emphasis on certain areas of your credit history that provide better judgment on your creditworthiness in holding a credit card account. If you are applying for a loan to purchase a new or used vehicle, the lender can request an Auto Enhanced credit score. This score places more emphasis on certain areas of your credit history that provide better judgment on your creditworthiness in holding a car loan. If you are looking to buy a home and need a mortgage, or are looking to refinance your current loan, the lending company can request a Mortgage Enhanced credit score. This score places more emphasis on certain areas of your credit history that provide better judgment on your creditworthiness in holding a mortgage. How important is your credit score to your finances? If you never use loan products, then a credit score doesn’t have much impact on your life aside from potentially increasing your car insurance rates. However, if you ever buy a car and don’t pay for all of it in cash, or buy a home with a mortgage, or use a credit card…then your credit score is very important. Having a high credit score (FICO score of 720 or higher) will lead to lower rates on these financing products. A mortgage rate that is 1% lower than you would get with an average credit score can save you hundreds of thousands of dollars over the life of the loan. You could have an extra few hundred dollars in your pocket every month because your payments on these products would be that much lower. My latest true FICO provided by Citi is 734, while my FAKO comes in at 701. @Shahin – He’s correct, but more importantly, lenders want to see good and stable income. Even if you have a great credit score, you will not be able to get a good loan without an income. I’ve recently been in the market for purchasing a home. I talk to an advisor and he mentioned that the amount of money you currently owe can also affect your credit score. I’m currently in school and my school loans dont reflect in my debt. But he said when I graduate my score may actually lower because my debt to income has been raised. However, if I keep up with the payments I can battle the hit and still keep my score which is around 750. I think it is interesting how much has been made over the difference between FICO and FAKO credit scores. True, lenders primarily use FICO because their markets (Wall Street) demand it. However, for the average consumer just trying to get an idea of how their credit score is doing and what they might need to work on, it seems rarely worth it to pay for a FICO score, versus getting one of the freebie FAKO versions. @Bill – Very good comment. I totally agree with you and there are plenty of free services that will give you a very good idea of where you stand as far as credit rating is concerned.